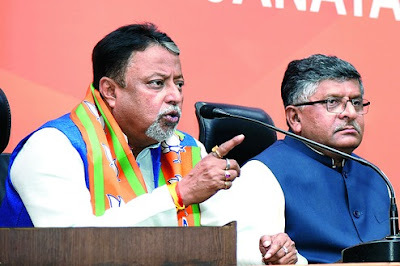 New Delhi: Mukul Roy finally joined the BJP and stuck to the theme of describing it as a secular party and refraining from attacking Mamata Banerjee, leaving it to Amit Shah to inject an element of surprise. BJP president Shah was present at the party headquarters but did not turn up on the stage where Roy was showcased. Sources said the party boss sought to be cautious, given the corruption scandals that hit Trinamul when Roy was a key figure in his erstwhile party and especially since Prime Minister Narendra Modi has made similar allegations the main theme of his campaign speeches in Himachal Pradesh and Gujarat. BJP leaders also said that Roy's stature was not such that the presence of the party boss was warranted. Sources said Thursday's meeting between Uddhav Thackeray of the Shiv Sena, the BJP's oldest ally, and Mamata also might have played a role in the timing of Roy's induction. After formally joining the party, Roy went to Shah's room and met the party chief. "The BJP is not communal but a secular force and I am very much confident that the BJP will grab power in Bengal for the benefit of the people," Roy said. Asked what role Roy would play in the BJP, Bengal minder Kailash Vijayvargiya said it was yet to be decided. The BJP remained a divided house over the induction of Roy. While central leaders expressed the hope that the former Trinamul Number Two could turn the tide in favour of the saffron camp in Bengal, state leaders remained sceptical over what he could bring to the table in the absence of Mamata. BJP leaders in Bengal resorted to politically sound statements - "BJP is like Maa Ganga, everyone can take a holy dip"; "he is very much welcome in the party"; "Anybody under Modi-ji's able leadership is welcome". Sources said the state BJP leaders were cautious about making any statements on Roy as his name figured in the Narada and Saradha cases - something the BJP had highlighted in its protests against the Trinamul Congress. "The law will take its own course," one leader said. Several BJP leaders questioned Roy's ability to turn the tide. "He (Roy) is nothing without Mamata (Banerjee). What can he bring in?" asked a senior state BJP leader. With 30 years in Bengal politics, Roy would play a key role in selecting candidates in his heyday in Trinamul, drawing up campaign strategy, managing cadres on election days and communicating with the poll panel. State BJP president Dilip Ghosh, however, tried to set the record straight, saying Roy could fill up the "leadership void" in the Bengal BJP. "The state BJP needs a manager to handle electoral politics and he (Roy) can play an effective role with his experience," said political scientist Biswanath Chakraborty. Mukul Roy finally joined the BJP and stuck to the theme of describing it as a secular party and refraining from attacking Mamata Banerjee, leaving it to Amit Shah to inject an element of surprise.